Imagine we lived just about 100 years ago and I pulled you aside and said it was possible to touch a couple wires to your chest and tell you if you might have a heart attack. Not only that, show you how each heartbeat can trace a line on graph paper. You’d be skeptical. But within a couple years, the electrocardiograph machine would be doing just that. Even today, most people probably don’t understand why or how such a common medical tool like the EKG works. Few would stop to consider such an essential diagnostic device is a perfect demonstration of the holistic nature of the human body. The fact that each heartbeat produces an electrical charge that can be picked up and measured anywhere on the body shows that unless we trust the holistic nature of the body, we cannot understand the true nature of health. One need only observe the dead, non-nutritious food that is served to patients in a hospital to realize how modern medicine just can’t seem to piece together how the body is an holistic event. It’s impossible to isolate functions and body systems like current modern medicine tries to do. An EKG proves that impulses from one event in the body (a heartbeat) can be observed in a seemingly unrelated part of the body (the skin). This makes it easy to accept what a young Hungarian physician named Ignatz von Peczely noticed back in the early 1800s. “Hoo” dunnit. As a child, von Peczely captured an owl in his garden. The owl’s leg was broken in the capture. Trying to immobilize the frightened bird, Ignatz found himself staring eye-to-eye with his captive raptor. The image he saw stayed with him for years. At the moment the bird’s leg had snapped, Ignatz noticed a black streak rising in the iris of the owl moving toward the pupil. He watched intently as the streak widened and lengthened. Ignatz was able to nurse the owl back to health and in the years that followed, the owl remained in the garden. Von Peczely went on to graduate medical school. As an adult, the young doctor had occasion to notice that the streak of black in his pet owl’s iris had changed to white after the owl had healed. Von Peczely worked as a physician in a Budapest hospital, mostly in the surgical ward. Surgery in those days was one of the greatest medical traumas a patient could experience. That holds true today, as it is still the most traumatic medical procedure the body can experience. With his proximity to extreme variations in the physical state of the patients, von Peczely noticed that significant changes occurred in the irises of patients, reflecting trauma and healing. He noticed consistent characteristics after surgery, illness or accident and became aware that a direct reflex connected various parts of the body to sections of the iris. The observed anomalies were published in text form in 1881 and correlated parts of the iris with various parts of the body. Later in the 19th Century, Swedish homeopath Nils Liljequist continued correlating the findings of von Peczely and added the effects of chemicals and toxins on the pigmentation of the eye’s iris. His published work is Diagnosis From the Eye. An eye for healing. It is believed that the changes in the iris are so dynamic and reflective because it is the most innervated part of the sensory system. Each iris contains several hundred thousand nerve endings and relates through the spinal cord, optic ganglia and optic nerves to all parts of the body. The biggest step in popularizing and expanding the field was taken by American doctor Bernard Jensen in 1952. Jensen became a natural doctor, graduating from the Oakland California School of Chiropractic in 1929. After years of research, he developed the Jensen Chart. It remains the authoritative source mapping the 180 zones of the iris that reflex the various organs and body areas. Jensen also published the internationally acclaimed The Practice and Science of Iridology, the most accurate source text on the subject. Jensen describes how to use iridology to determine imbalances in the body. 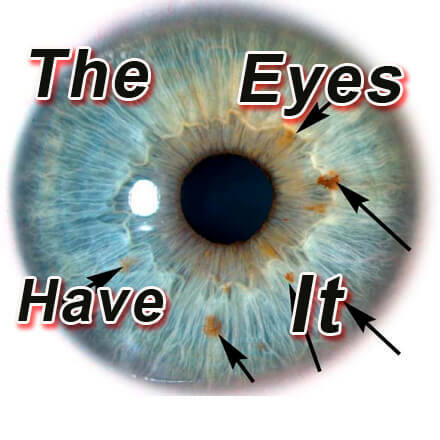 Every organ, gland and system has a specific location in the iris that reflects its state of well-being. If there is a weakness or inflammation, the iris responds with a telltale marking. Once the compromised area has been identified, the remedy is applied and the iris reflects the improvement by replacing the black line, spot or lesion in the iris with a white line. Iridology has become a rare practice but one has to weigh the choice between its passive observation of a bodily function for diagnostic purposes against allowing some technician to irradiate your body or poke holes in it to find out what ails you.